Every year since 2007 your editors have unveiled a new cocktail for the season, live on-air, with Rex on the Fool’s Paradise program on WFMU. This year’s bracer, courtesy of the Radio Bartender, is O Tavern Bound. 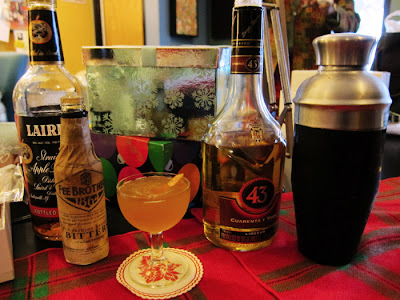 For the base of this cocktail we use apple brandy, in tribute to New Jersey’s lush colonial history of taverns and applejack. Local applejack was made by the Lairds at the Colt’s Neck Inn (1717-1849) and is today distilled by their descendants down the road in Scobeyville (that’s west of Long Branch). If you’re not familiar with Licor 43 – “Quarente Y Tres” – it’s a heady Spanish liqueur with pronounced vanilla and botanicals. In a shaker half filled with ice, add the first four ingredients. Shake and strain into a pre-chilled cocktail glass. A small twist of orange peel for garnish. Here’s to us all. Drink up every one! Ears to a Happy Holiday! 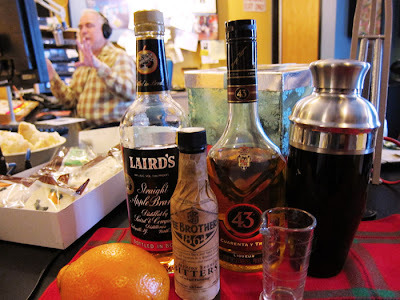 This Saturday everyone's fave holiday tradition, the Radio Bartender, returns to the "Fool's Paradise" featuring Rex on the mighty WFMU! As always, Grade "A" Fancy's head mixist Karen will unveil a new cocktail for the occasion, live on air, amid much radio hi-jinx. You say you want to play along at home? Alrighty. As you know, our exclusive Fool’s Paradise cocktail requires no special-order syrups, no eye of newt-infused spirits, no eyedroppers or custom gadgets; all of this stuff is available at your grocer’s, and from the local spirits emporium. Tune in to Rex from 1 to 3pm on the Fun 91! WFMU 91.1 fm in New York, at 90.1 fm in the Hudson Valley. If you are not in the tri-state area you can listen in real time via the World Wide Web, or sample the archived show any time, any season. Here's to us all! Drink up every one. Breaking news: All this month Grade "A" Fancy will be posting as the guests of Herb Lester Associates on their Journal page. Our first contribution looks for the center of New York City. Check back next week for more. The second installment of our journalistic scribblings takes an historical gander at Sutton Place, the Dead End Kids, and one swell looking warthog. It pays to watch where you're walking in the third edition of our guest spot. You can't go wrong with a small helping of suds. This issue takes an appreciative glance at the pleasures of a short beer. You've got time for a quick one, right? They creep! Undead saloons and restaurants that couldn't die. When a dearly beloved spot expires it's best if it just disappears completely. In this issue we look (with horror) at what happened to Fedora, among others, and consider the consequences when zombie invasions wreak havoc with our memories. Grab your pith helmet, Grade "A" Fancy is on safari in deepest Queens in search of liquid exotica. Our prize: Zhumir Aguardiente from Ecuador. Living in Queens, a stroll through your local liquor provisioner becomes an international shopping spree. This week we had a thirst for something summery, but out of the ordinary. A spirit from a warm country seemed like a good place to start, and the hunt was on. Central Queens is home to many South and Central Americans, so we had a wander through Five Star Wine & Liquor on Woodside Avenue. Rum, cachaça, pisco — all delicious, but not quite the exotic prize we wanted for this safari. An unusual painted bottle and bold label drew our eye to a shelf full of Zhumir Aguardiente. If they stocked so much of it, people must be buying it, but rotgut sells as well as the good stuff so that was no guarantee of quality. The always enthusiastic, helpful gents at Five Star told us they sell a lot of Zhumir to their Ecuadorean customers. They also dispelled our fears that Zhumir was total alky red-eye. At $14, it wasn’t a serious investment so we bought a bottle and took it straight home (after a quick look in at Donovan’s to make sure that Guinness was still served there). A little research revealed that aguardiente is a generic term, literally "firewater," that describes a variety of potent potables. Our Zhumir Aguardiente is made in Ecuador and is not the same product as an aguardiente from, say, Colombia, which tastes of anise. 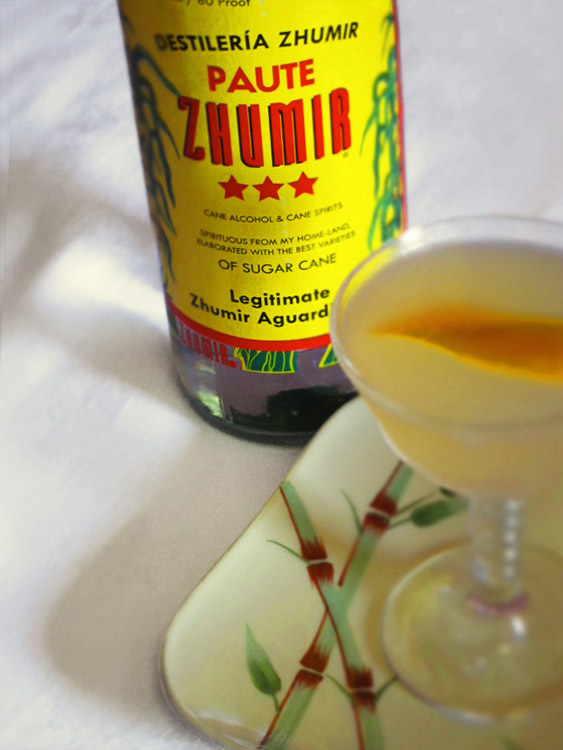 Zhumir is distilled after the fermentation of sugarcane. Besides drinking straight shots, Ecuadoreans enjoy aguardiente in canelazo, a hot drink made with piloncillo brown sugar and water boiled with cinnamon. Some recipes include the juice of limes, lemons or oranges. The green rhubarby-limey juice of the naranjilla is another popular mixer in Ecuador. 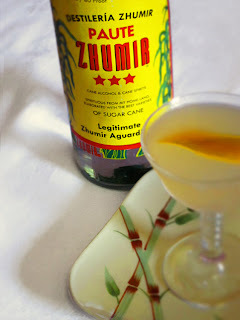 Zhumir’s website tells us their aguardiente is "for the beach, the jungle, and the mountains." That description seemed a little one-size-fits-all, but is actually right on target; it mixes well with fruit and can replace rum in any tropical drink, it has a somewhat overripe, jungly aroma, and bestows a soothing warmth, much like brandy, or pisco. It reminded us of Batavia Arrack (which derives from molasses and fermented rice) though Zhumir, at 80 proof, lacks its 100 proof heat. The texture is smooth and velvety, the scent and aftertaste suggests a pleasing funk, redolent of very ripe banana or cantaloupe. All this serves to mingle beautifully with spices and fruit juices, making this aguardiente a useful ingredient for the tropical drink enthusiast — and an affordable one, for once. We have to confess we aren't big fans of the Great American Tiki Drink. We love the gimmickry (what grump could hate a hollow skull full of booze bestrewn with flowers and a plastic monkey) but they just don't satisfy like a proper Martini. So how to play nice with our aguardiente, but avoid the sugary fruit? We happened to be halfway through a classic volume of beverage lore, The American Drink Book (1953), this week and were reminded of a Roaring Twenties concoction, one with the truly awful — and oddly 1970s-sounding — name of Between the Sheets. The recipe calls for white rum, brandy, Cointreau, and lemon juice. Usually we’d pass on drinks with dopey names and multiple liquors; most turn out to be muddy novelties. But this Between the Sheets was a big hit in its day, touted to be well-balanced and beguiling. It read like a souped-up sour, or a Caribbean Sidecar. You can see where this is going, right? We experimented with substituting the aguardiente for the rum. And do you know what? The fruity funk of the aguardiente was terrifically appealing. In fact, it’s sublime, better than the rum version. It’s a tiki drink gone sophisticated. We also added a twist of orange peel, in a nod to the canelazo. Because no grownup ever needs to utter the words "Between the Sheets" to her bartender, we’ve named our new take after Ecuador’s highest peak. The summit of Chimborazo is the farthest point on the Earth's surface from its center. Your own elevation will depend on how many of these you're brave enough to put down. Shake well with cracked ice and strain into a chilled cocktail glass. Garnish with a twist of orange peel. *Note: Do not substitute Columbian varieties, like Cristal, which have an anise flavor. The preceeding adventures in booze appeared in a slightly different form in the Summer 2012 edition of Edible Queens magazine. Exciting news at Grade "A" Fancy headquarters today. We proudly present our ideal map of Greenwich Village, the product of a collaboration with the fabulous Herb Lester Associates. This is a guide to the Greenwich Village you had in mind: that place famous for attracting artists and charlatans, litterateurs and anarchists, immigrants from lands afar and refugees from a stifling strait-laced society as close as the next subway station. The words and design are ours, but the inspiration for this project is the good people at Herb Lester. They put out a dazzling line of tourist maps — real inky-papery objects, mind you, none of this virtual tat — every one of which sparkles with wit and delights the eyes. You are all required to visit their site and buy every last thing on it. If you live in the tri-state area, you can find Herb Lester goods at the Strand, and at McNally Jackson bookstore in SoHo. More brick-and-mortar purveyors all over the world can be found here. And this is a set of photos to whet your appetite. 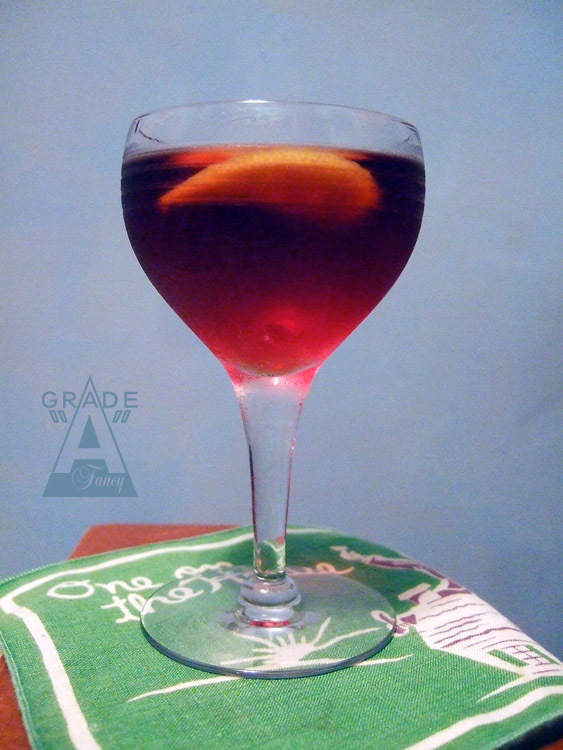 Grade "A" Fancy explores the charms of a Croatian wormwood-based liqueur called Pelinkovac. Read all about it here in the pages of Edible Queens. You know that the Grade “A” Fancy Beverage Commission endorses only drinks that have a swift shaker-to-table appearance. The oft-quoted Harry Craddock of the Savoy Hotel, London, said that a cocktail should be imbibed quickly, while it’s still laughing at you. The GAFBC says it must also arrive in front of you at a decent clip, while you can still laugh with it. We enjoyed this one last night, and it’s so simple and satisfying we predict it will stay at the top of our rotation. It began in our test labs as an applejack takeoff on the Manhattan, but when we replaced the Italian vermouth with Dubonnet, and in a smooth one-to-one ratio, it frankly purred like a fine engine. For a garnish we added a lemon twist – it turned out to be a zingier garnish than that cherry you assumed would be indispensable. A dash of Angostura bitters makes it very stimulating, indeed. We then hied it to our library for a spot of cocktail bible study—because of course such a simple drink could not possibly be new—and in our search discovered that Mr. Craddock’s own Savoy Cocktail Book contains a Bentley cocktail with the same liquors, yet no garnish or bitters. We urge you to try our new vintage Bentley Cocktail for 2012. Strain into a chilled glass and garnish with a twist of lemon peel. A toast: To top professionals and talented amateurs!